The horse was found on Peamount Road on Monday (car belongs to My Lovely Horse volunteer). 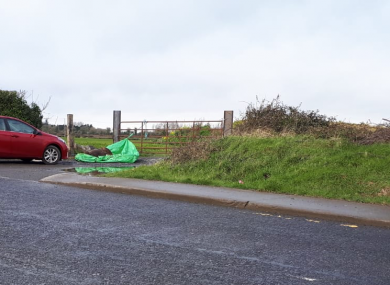 A HORSE WHOSE body was found dumped in a skip bag on the side of a Dublin road was likely used in sulky racing, a charity has said. A woman who was out walking her dog on Monday came across the horse’s body on Peamount Road in south county Dublin. She contacted the My Lovely Horse charity and co-founder Martina Kenny went to the scene this morning. She told TheJournal.ie that the horse, which she estimated was under the age of two when it died, looks as if it had been used for sulky racing. “She was shaved like they do for sulkies, her mane was shaved. And she was wearing shoes which she shouldn’t have been at that age. Her feet were still growing, she must have been in so much pain. The charity regularly comes across abandoned horses, both alive and dead, who have been used in sulky racing. The ones who are alive are often so weak they do not survive long after they are saved. “Every single week we get a call of either a dying horse or a dead horse. All around Dublin we’ve had to put horses down, it’s happening everywhere,” Kenny said. Some are injured, others are starving and have been left with absolutely nothing. One horse in a northside Dublin area was so emaciated they had to get a vet to come put her down. And there was another near Dunsink in Finglas, we had to put her down. There was the body of another horse beside that one. Kenny said this was all in the space of three weeks. Volunteers from the charity were out again last night attempting to rescue abandoned horses in the same area this body was found. There were calls last year for tighter regulations in relation so sulky racing after a number of instances including one where a horse was found collapsed in a housing estate in Cork. Just days before this incident a video had emerged of an exhausted pony being dragged by two youths on a public road after collapsing as it carried a cart. An inquest in January last year into the death of a 12-year-old who was thrown from a sulky car on a public road recommended specific by-laws to regulate their use. Independent TD Mattie McGrath soon after introduced a bill to the Dáil which would prohibit sulky racing, but there has been little movement from the government to put specific legislation in place. Last year Minister for Agriculture Michael Creed, whose remit is animal welfare, told McGrath that the use of sulkies or any other horse-drawn vehicles on the roads is a “legitimate activity provided it is done in a safe manner giving due care and consideration to other road users and the animal’s well being”. He said illegal racing activities taking place on roads, involving any type of vehicle, was a matter for An Garda Síochána and the Department of Transport. His department did roll out a number of courses to promote good horse welfare among sulky owners in Dublin, Cork and Tipperary last year. He said the course encouraged participants to move away from “the road racing practices to racing on tracks and to engage with the regulated sport of harness racing on tracks as operated by the Irish Harness Racing Association”. Email “Body of young horse that was used for sulky racing dumped on Dublin road ”. Feedback on “Body of young horse that was used for sulky racing dumped on Dublin road ”.